The SUNSET CAMPOUT FAERIE RING is excited to collaborate with DANNY GOLDBERG’S SOUND IMMERSION EXPERIENCE to bring you a pre-campout grounding experience to help sooth your mind and body during turbulent times. PLEASE ARRIVE: AT LEAST 15 – 20 MIN IN ADVANCE to get situated. We will be starting on time and locking the doors within 10 minutes of starting. WHAT TO BRING: Yoga mat, blanket, pillow, and anythying else to make yourself comfortable for the experience. The venue does not have any. TICKETS: $25 in advance, $30 at the door if available. This event has LIMITED CAPACITY so be sure to purchase your tickets in advance. SACRED SPACE/ALTAR: Altar design by Lacey Patterson (Living Fae). 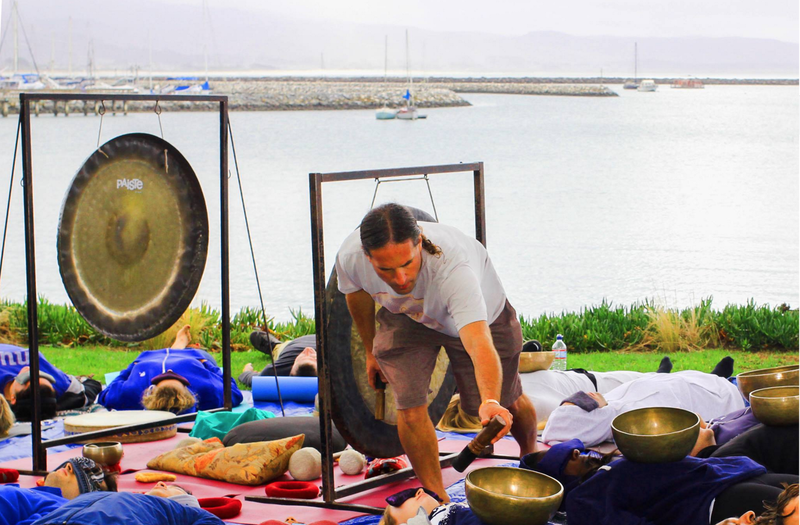 Danny is creator of the Sound Immersion Experience in which he weaves the restorative vibrations of singing bowls, gongs & chimes to create a blanket of healing sounds. The vibrations of these instruments enable us to journey within & center. The sound provides a channel for release, opening & transformation, tuning our vibrational frequency. Danny performs solo & in collaboration with Hatha Flow, Yoga Nidra, Yin/Restorative, Kundalini, Qigong, Breathwork, EFT & Meditation Danny offers the Sound Immersion Experience for individual or group sessions at yoga studios, healing centers & events throughout the U.S.including: Stanford University’s Health Improvement Program, Globe Sound Healing Conference, Phases of the Moon Festival-Sanctuary Producer, New Living Expo, Wanderlust Yoga Festival, Breathe Yoga, Divinitree Yoga, Yoga Tree & many more. Danny has performed for Sunset Campout, UC Santa Cruz & Foothill College Music Programs, Science & Nonduality Conference, Lightning in a Bottle, Beloved, Lucidity, Symbiosis Gathering, Sunset Campout & many other events.